One mathematical model can be used to predict how the intake of a drug is going to affect different organs and systems. This modeling could be applied to epidemiology cases and public health. The postulate that goes “the shortest path between two points is always a straight line” hasn’t been rebated yet. However, is the shortest way always the most probable? One study recently published in Science Advances seems to prove that it is not always like that. Jonathan Wheeler is a CONICET doctoral fellow at the la Facultad de Ciencias Exactas y Tecnología de la Universidad Nacional de Tucumán [Faculty of Exact and Natural Sciences of the National University of Tucumán] and one of the authors of the study. Together with the University of Rovira i Virgili in Spain, the researcher worked on the development of a mathematical model to predict propagation pathways of disturbances in complex networks. That is to say, how one event (for instance the administration of a drug) or series of events activate a cascade of events that occur at certain times and places and act upon other points of the network. In practice, they determined how the intake of a synthetic drug or a natural extract affects one organism performing only very few observations. “One event like this one affects different points in the human metabolic network but so far it was not possible to measure or sample everything so as to know how it affects the system. So, with very few samples, this mathematical model can predict which is the ‘path’ affected in the process”, Wheeler describes. It is like drawing a map of interconnected points. To make it simpler, when a drug is administered, it acts upon an A substance and, through a series of metabolic pathways, upon the substance B and the system 1 via a series of biochemical reactions (in this case represented by dotted lines). But, is the shortest path always the most probable (that is to say, with a lower number of reactions) from A to B or is there a series of intermediate and collateral steps that also affect other part of the system? The experience involved measuring the concentration of some molecules that intervene in the metabolic pathways of the body called metabolites and can be, for instance, enzymes or proteins. Their amounts were determined before and after the administration of the drugs. Wheeler comments that when the team noticed significant modifications in the concentration, they could deduce there were perturbations in the metabolic network. 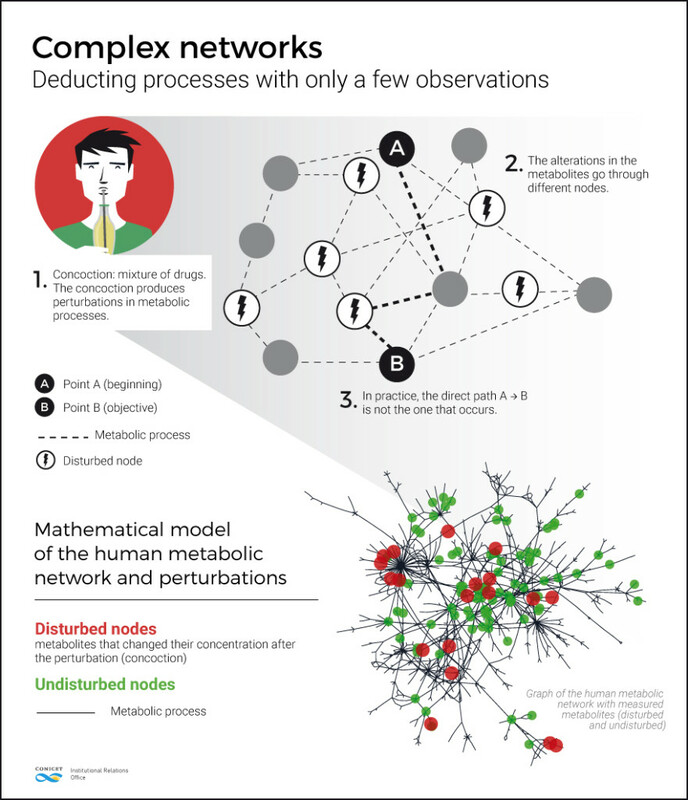 From a few measures and samples obtained at specific places and moments, the mathematical model developed by the scientists would be able to deduct what happened at the metabolic network and with the rest of the metabolites that could not be measured. To conclude, is it most probable that in the organism one reaction follow one direct path (shorter) from A to B or that there is a series of alternative steps that affect other intermediaries? The statistical model of the researchers shows that the second option is the correct one. “We proved that the shortest path is necessarily the one that takes place, which is what traditional mathematical models proposed. 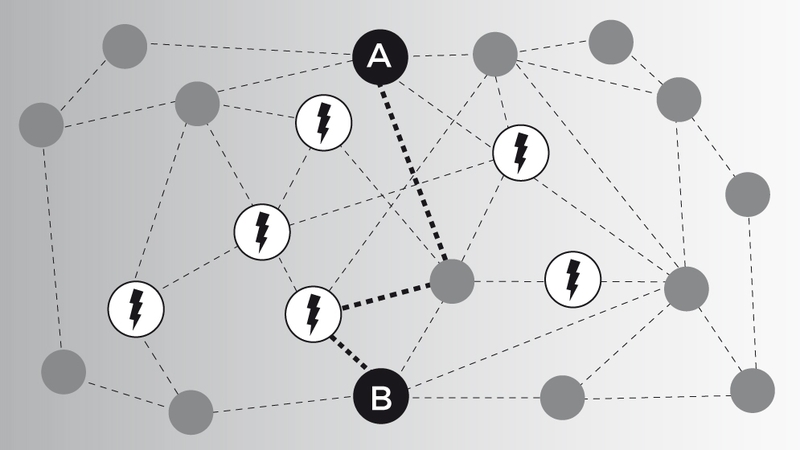 The deduction network from one statistical model turned out to be more effective and can improve the results in comparison with the traditional models”, the scientist comments. The development of this type of mathematical system has significant practical uses, such as during epidemics. “In those cases, the researchers study the network of international airports to determine whether one has to be closed or it has to limit its traffic. Let’s suppose that there are people infected in Argentina and maybe in Colombia: through a study of the networks it is possible to predict if there are people infected in Brazil, Venezuela or in other countries. After that, studies have to be made to know if they are infected or not, but a priori, we can form a network of possible people infected in other countries and let them know so as to take the appropriate measures and cope with the situation in time”, Wheeler concludes.